Housed in rugged composite case. Suitable for inflating tyres on cars, vans and 4x4s. 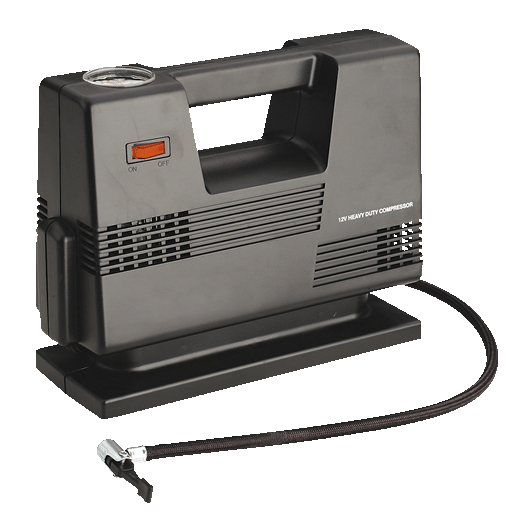 Powered by reliable, heavy-duty motor compressing free air to 30psi at the rate of 45ft³/hr. Integral gauge reads up to 20bar/300psi. Supplied with plug for use in vehicle accessory power socket. Accessory kit, containing Presta type adaptor, ball spike and two inflatables adaptors included in storage compartment on base.